Throughout the year, have a pleasure very near! You don't have to wait for autumn to enjoy the autumn fruits - this soup pleasure is available throughout the whole year! 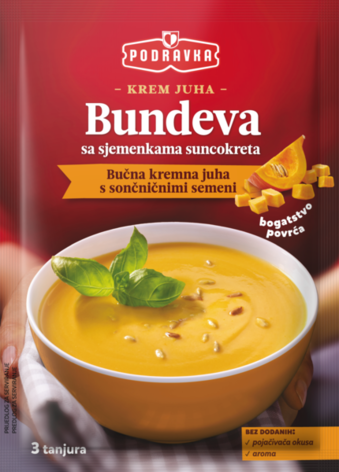 This is a perfectly creamy soup with ripe pumpkin flavour and taste, complemented with crispy sunflower seeds and carefully selected spices. Without artificial colours, aromas and flavour enhancers. Preparation: Empty the packet contents in 750 mL of cold water. Mix with the whisk until boils. Simmer for 5 minutes stirring continuously. Ingredients: dried pumpkin 24.6%, corn starch, palm oil, table salt, wheat flour, sunflower seeds 6,9%, potato starch, corn flour, sugar, skimmed milk powder, yeast extract, lactose, dried onion 1.5% , milk protein, spices, acid (ascorbic acid, citric acid), color (paprika extract). May contain eggs and celery. Storage: Storage: keep in dry place at room temperature.